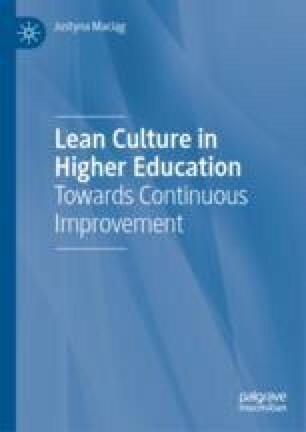 The author presents the reasons for undertaking research on Lean Culture (LC) in higher education (HE), as well as the methodology followed in the research presented in the book. She defines the adopted ontological and epistemological approaches to research on LC as the organisational culture of higher education institutions, cognitive gap, cognitive and methodological objectives, research problems, as well as research theses and hypotheses. The author describes also the stages of the research on LC in HE. She presents the applied qualitative and quantitative methods as well as the criteria of selecting universities to participate in the research. Francis D. E., Krehbiel T. C., & Balzer W. K. (2017). Lean applications in higher education. Downloaded from https://the-lmj.com/2017/03/. Waterbury, T. (2011). Educational lean for higher education: Theory and practice. Lulu.com.